UPDATE: NEW HOMES GOT FOR “Wayne” & “Lucian” Many thanks. 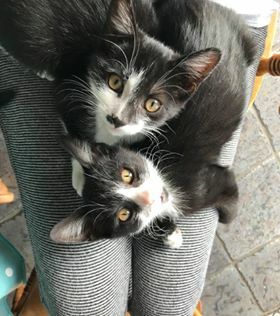 REHOMING:BLACK & WHITE MALES (2) KITTENS 14 WEEKS OLD APPROX. New homes required for “Wayne” & “Lucian” Black & White 2 male kittens 14 weeks old approx,very friendly,socialised and litter trained. Both vaccinated. Please share. Interested please message or phone Kilkenny SPCA @ 056-7771635. Ref:268423.